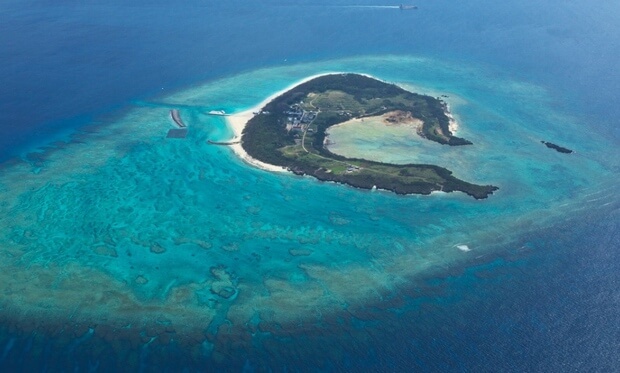 Minna Island is an isolated island popular for its convenient access from the Northern Okinawa main island. Would you like to enjoy swimming in the ocean and other ocean activities in a surprisingly beautiful ocean? 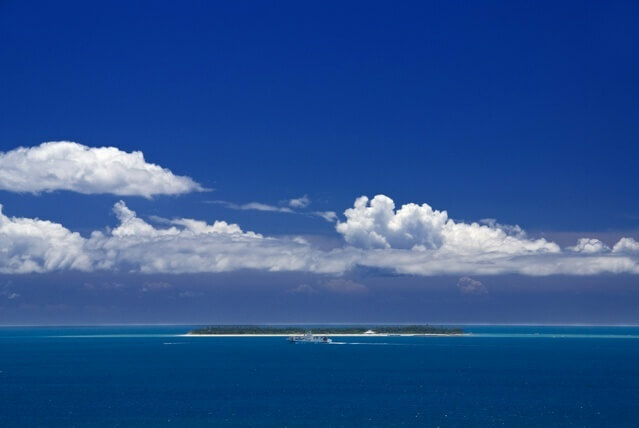 Here, we will be introducing this beautiful isolated island, Minna Island. 1．What the “Minna Island” is like? 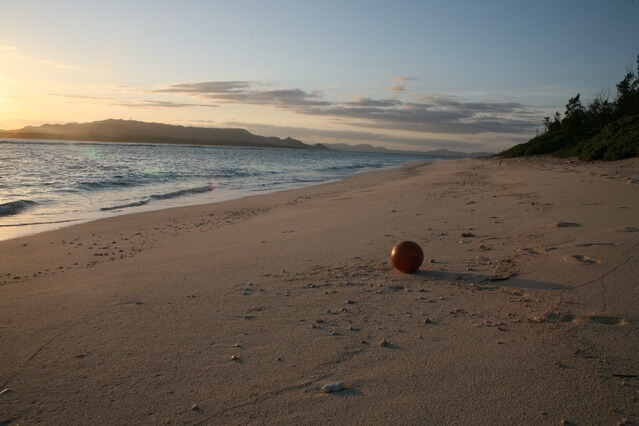 3．Play in the Minna Island! 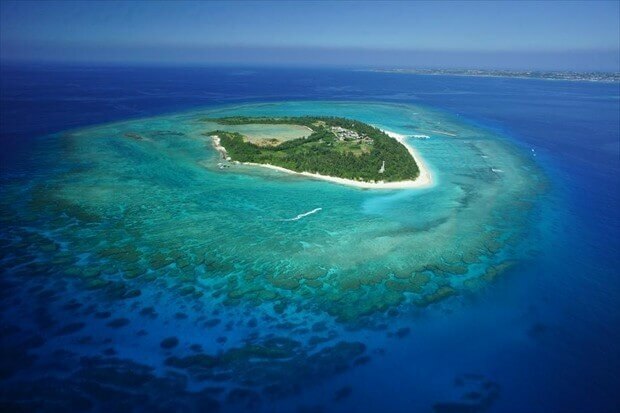 Minna Island is a small island to the West of the Motobu Peninsula on the main island of Okinawa. The population on the island is just about 40 people, however, a total of 60,000 people, domestic and foreign, visit the island yearly. 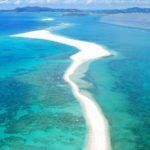 The reasons for its popularity are its location, a mere 15-minute ride on a ferry from the Port of Toguchi on Motobu Peninsula, and the surprisingly beautiful ocean. The shallow shelf is perfect for swimming. 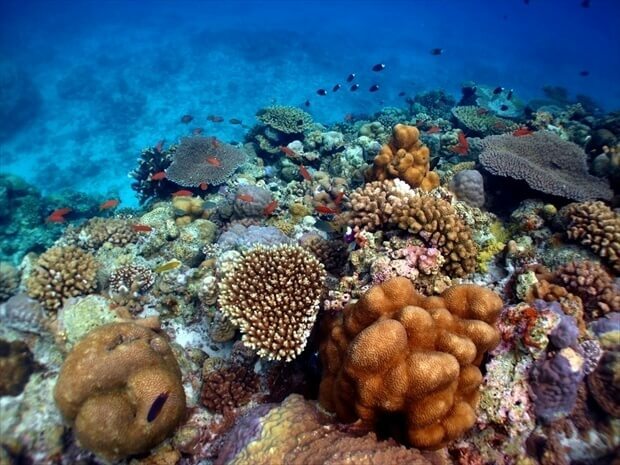 Moreover, many divers are attracted by the colorful coral reefs and tropical fish around the island. The ferry schedule varies by season. During the summer vacation time, it runs every hour. Getting the tickets require special consideration. The tickets cannot be reserved ahead of time. Expect heavy congestion during the busy season. 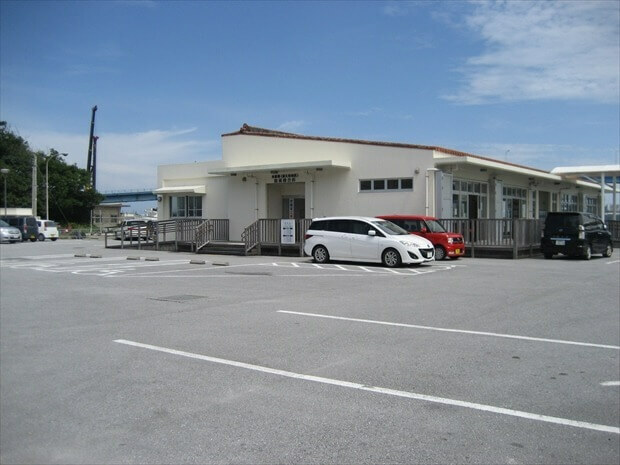 Arrive more than 30 minutes before departure time, and secure round-trip tickets at the ticket office at the Port of Toguchi. Let’s head to the ferry. 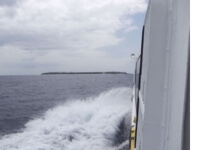 The inside of the ferry is air conditioned, however, step out onto the deck to enjoy the sea breeze! Look for Sesoko Island on the left, and the Ocean Expo Park on the right, and you will arrive at the Minna Island in about 15 minutes. The clarity of the water, which allows you to see the bottom of the ocean, is simply amazing. Port of Toguchi. Parking is limited at the port parking lot. it expects to be full during summer. Boarding spot for “New Wing Minna.” A great photo-spot on the deck. After a while, Minna Island is visible ahead. It is a very short trip. this is a beach highly recommended by the locals, with clear water and beautiful white sand. There is a net and a buoy offshore, and lifeguards onshore, for a peace of mind when allowing small children to play at the beach. 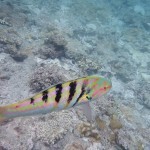 There are corals and tropical fish in the swimming area (inside the net). Swimming goggles are sufficient to enjoy the waters of Minna Island. Of course, a variety of activities are also available. Unfortunately, the clarity of the water will decrease because the number of visitors during weekends and holidays in the summer(due to the sand scattering in the water). For those who are looking for“enjoy more beautiful water,”　we recommend taking the snorkeling tour, which will be mentioned later. At the beach, underwater masks and snorkels are available to rent. Alternatively, make reservations at the shops outside of the island to enjoy a wide variety of activities including, banana boat and scuba diving. Activity in The Sea Water! 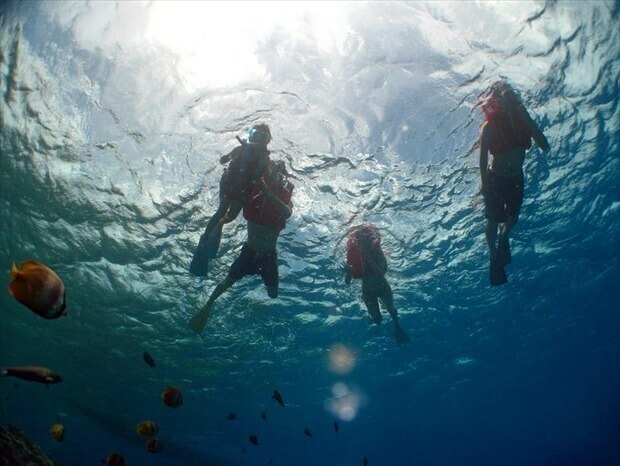 A snorkeling tour that takes you outside of the swimming area by a boat to swim with the tropical fish in amazingly clear water. 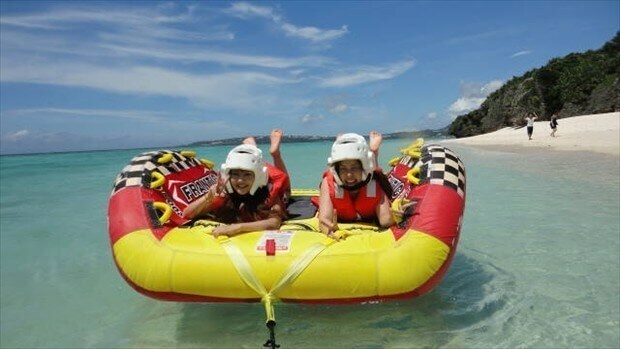 ○One marine sports, goagle, life jacket, free snorkel rental and a beach parasol are included. 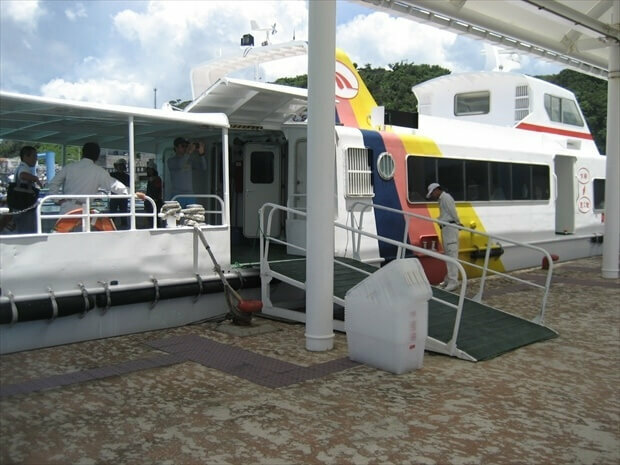 ○Minna Island Express Ferry (Round-Trip) is attached. A diving experience for beginners. Easily experience the mysterious world of ocean. 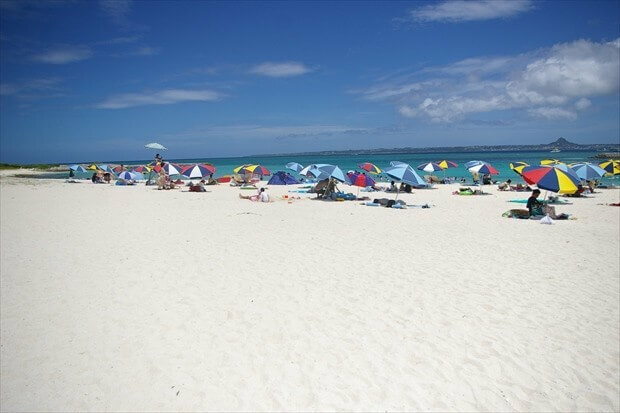 ○Goagle, life jacket, free snorkel rental and a beach parasol are included. Enjoy the ocean with a selection of popular ocean activities! 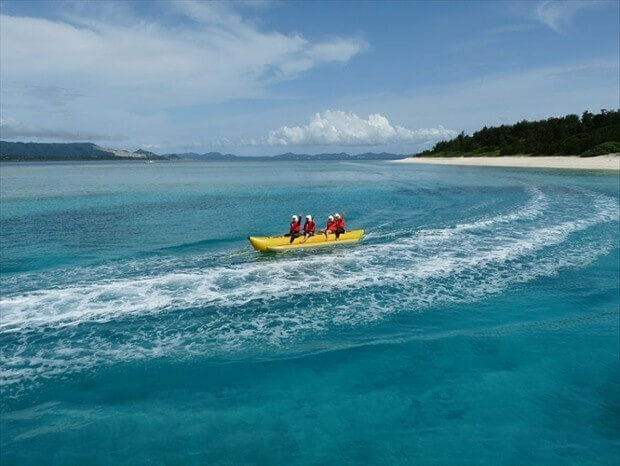 Make a splash and jet across the waters of Minna Island. 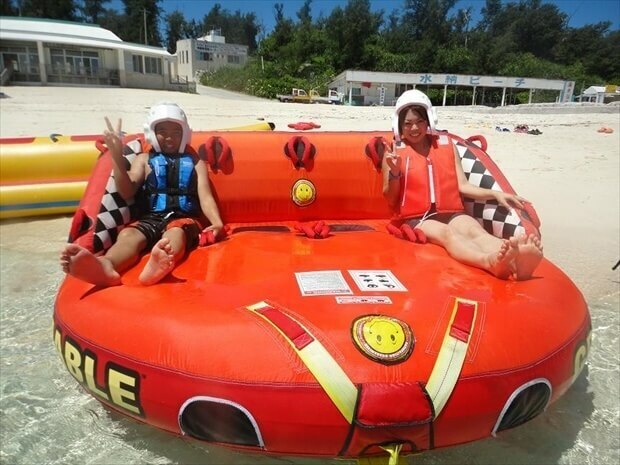 ○You can experoence these three marine activities : U-Tube, Big Marble and Banana Boat. ○A Beach Parasol is included. You cannot miss the banana boat! 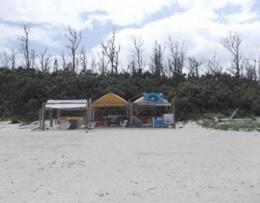 There is a store on the Minna beach to purchase drinks and light meals. For some items, there is not much variety, and orders flock during the busy season. During the busy season, use the parlors set up along the road to Minna Island community to procure delicious things. Looking from the dock, the waiting room for the ferry is on the left (the white building on the right side of the image). It has restrooms. A visitor information center located 30 seconds away from the beach. It has restrooms, showers, changing rooms, a shop, and vending machines. Additionally, you can rent a variety of items for the beach. It is bustling with visitors during the busy season, however, the atmosphere drastically changes to a quiet beach, after the departure of the last ferry. The locals relax to enjoy the dusk, and it is amazing to take a stroll on the beach and look at the stars in the night sky. If you come all the way to Minna Island, you must spend the night. Only a few hotels are available, but they all offer a homely feel. It will be a very different experience compared to the resort hotels on the main island. There is a number limitation(max.four people) in the high season, but you can stay alone except for the peak season. There is a new building available, too. 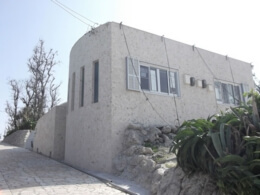 This hotel is pension type (second floor) which is rare in Minna Island. The view from the terrace(2F)is highly recommended. This is a cotage type which is built by Marine Shop. There is BBQ plan and two meals are included. 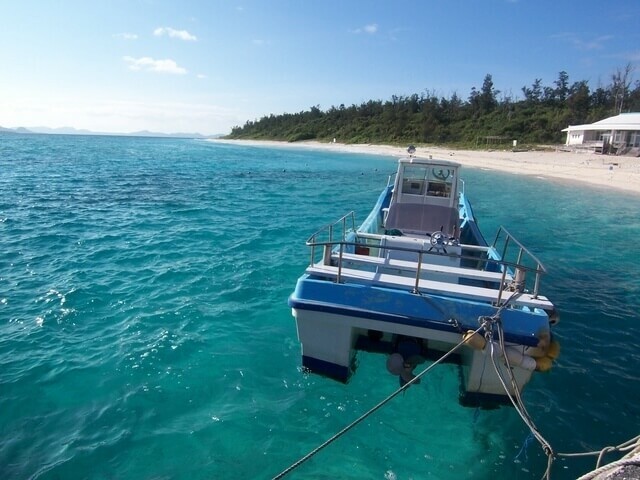 You can easily visit Minna Island during your trip to the Okinawa main island. 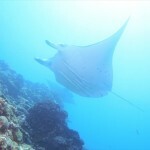 There are essentially no tourist spots, but the beauty of its waters is recognized by the locals. A definite must for those looking to enjoy the ocean! 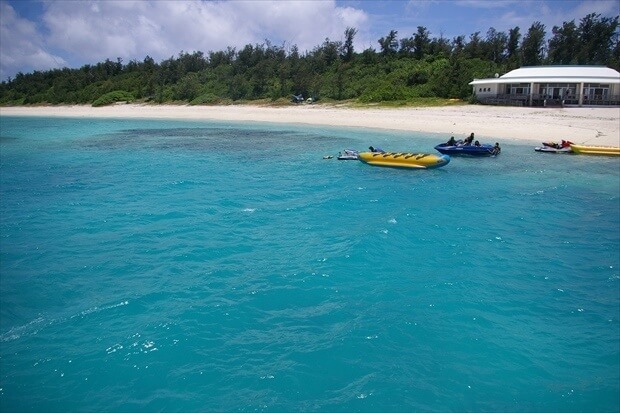 Would you like to spend a day on Minna Island during your next trip to Okinawa? 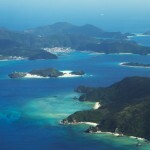 Sesoko Island ~Fascinating Remote Island which is accessible from Naha!